In last week’s Trader’s Corner, we discussed the difficulty of timing the bottom of a price decline. We wrote that piece because we knew many propane retailers were uninspired to buy, as is often the case in a falling market. Retailers tend to buy when they feel threatened by rising prices. There is a tendency to become complacent in a falling market, which leads to missed opportunities. 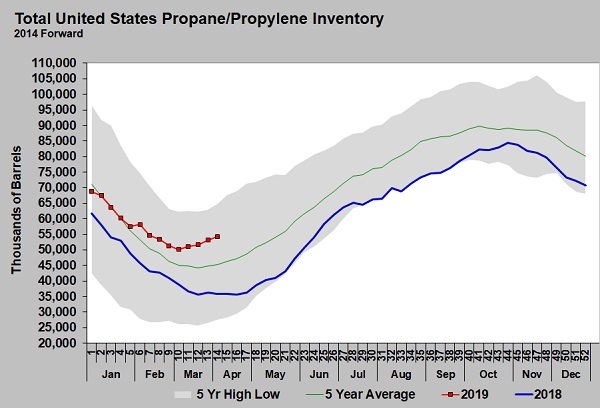 “The good news for propane retailers is this weakness has created an exceptionally good buying environment for supply for this late in the year. Current values are 35 cents below highs from just six weeks ago, and such low values relative to crude takes a lot of the risk out of purchases. On Nov. 9, when we wrote those comments, Mont Belvieu propane closed at 73 cents and Conway at 69 cents. Last week’s Trader’s Corner was sent on Monday, and by Tuesday, Mont Belvieu reached 69.25 cents, and Conway reached 60.25 cents. The chart above shows propane and crude prices bounced higher since Tuesday, Nov. 13. 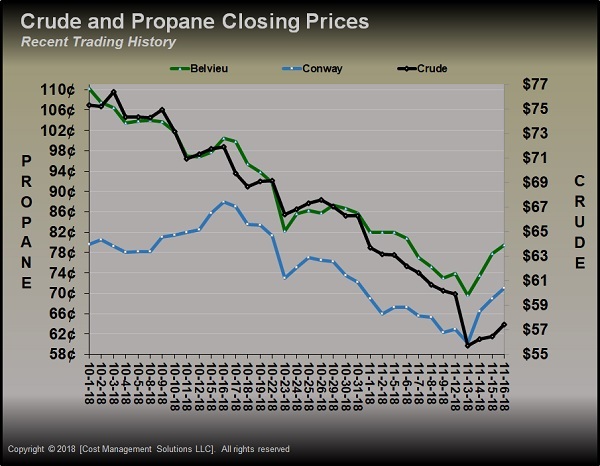 As of Nov. 16, Mont Belvieu propane traded at 79.5 cents, and Conway traded at 71 cents. Prices are higher than they were when we wrote last week’s Trader’s Corner, and they are significantly higher than the low set on Tuesday. Keep in mind, we had no idea the bounce was going to occur when we were writing last Friday. We don’t have a crystal ball, so there was no way we were attempting to predict that prices were hitting a bottom or about to bounce. The only thing we knew for certain was propane’s price movement prior to Nov. 9. In our view, that movement created an opportunity. One week later we still don’t have a crystal ball. Prices could go down again. 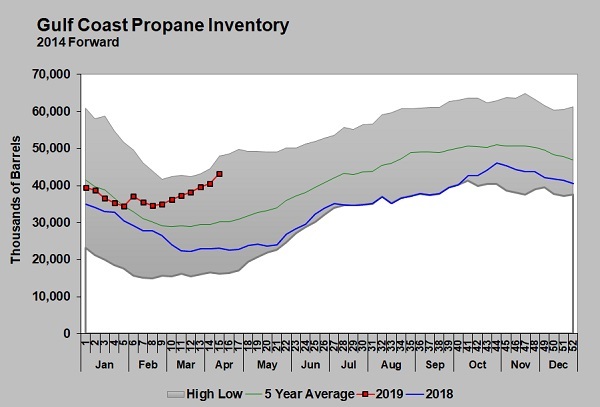 An even lower low could be put in for propane prices this year, but that still doesn’t change the fact that the recent downtrend created a buying opportunity. 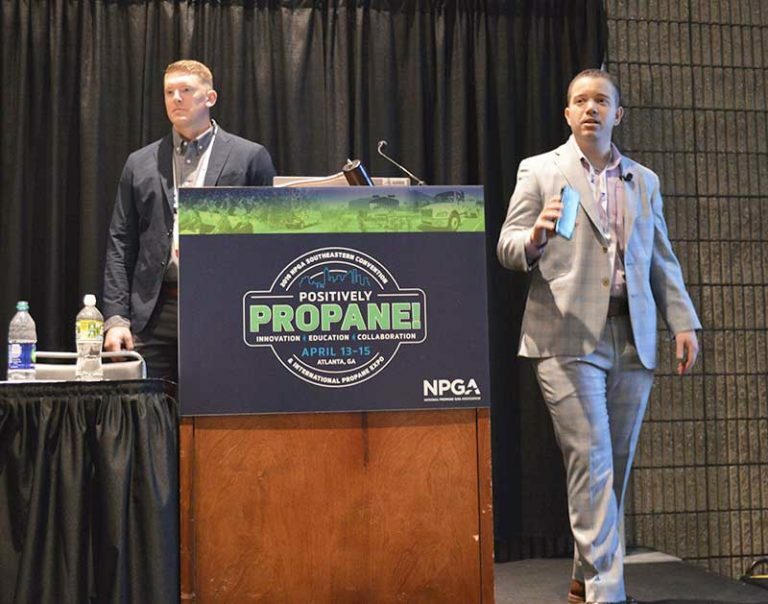 Propane retailers who are less worried about knowing the bottom of the market and more focused on buying opportunities will, in the long run, almost always stay ahead of their competition. Perhaps more importantly, opportunity buyers capturing good values provide their customers with stable pricing and protection from price spikes. If a retailer is customer focused, not competitor focused, buying opportunities become easier. 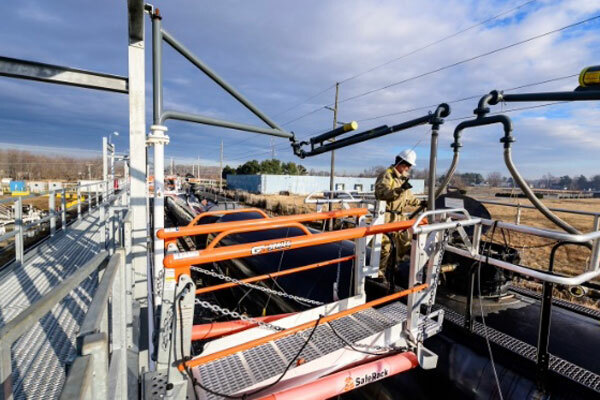 Buying during this recent opportunity would have likely allowed a retailer to provide customers with propane priced at close to – if not lower than – what they paid the previous year. When that occurs, it becomes much more difficult for competitors to dislodge customers. Propane retailers that only use price to try to steal customers are among the worst opportunity buyers. They are scared to buy because they need the lowest price to attract customers. Retailers that are opportunity buyers rarely have to worry about competitive pressures from those types of players.